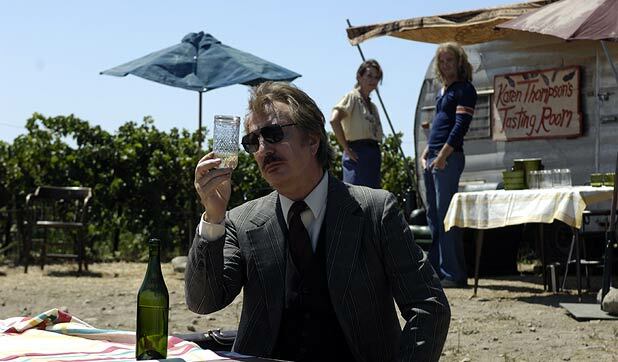 After the pleasing sideswipes featured in Alexander Payne’s Sideways, the comic possibilities of wine-snobbery are placed firmly at the centre of Randall Miller’s Bottle Shock, which purports to tell the true story behind the sudden rise to prominence of the Californian vino industry. Miller’s script, co-written with Jody Savin, focuses on various characters living and working in the Napa Valley vineyards in the bicentennial year of 1976. Weaving multiple plot strands in a manner similar to his anodyne 2005 film Marylin Hotchkiss’s Ballroom Dancing & Charm School, Miller attempts to build up to the blind-tasting finale by focusing on a wide canvas of characters in an attempt to provide the varied cultural mix of Robert Altman’s Nashville. After introducing Alan Rickman as entrepreneurial British wine-expert Steven Spurrier, Miller widens his scope to feature the strained relationship between local vineyard boss Jim Barrett (Bill Pullman) and his son Bo (Chris Pine, soon to be Captain Kirk in the forthcoming Star Trek movie). And there’s a further sub-plot involving Bo’s battle with Gustavo (Freddy Rodriguez) for the attentions of pretty intern Sam (Rachel Taylor). Miller and Savin get some obvious comic mileage from various clichéd culture clashes, but apart from Rickman’s delicately poised evocation of a pretentious wine buff with a secret penchant for fried chicken, the forced laughs of Bottle Shock more resemble passable supermarket plonk than a fine vintage. General release from Fri 20 Mar.